How to Recut Your Movie... Mini Masterclass in Under Ten Minutes! As part of 50 Kisses, we invited filmmakers to act on feedback from the community. 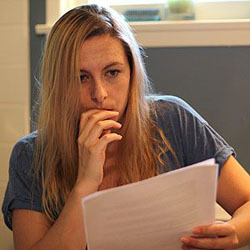 Above is the first cut which, like so many filmmakers also did, they submitted to 50 Kisses as their final edit – with the feedback and the time to reflect, they recut their film and improved it. The lesson here for us all is to seek credible feedback BEFORE we complete – and for Impact50 filmmakers, almost every film we have seen could be improved. You have gone so far already, you should go the distance right? Remember, filmmaking is the art of saying the most with the least. And if you are interested, below is the Directors Commentary that we produced for the DVD release of 50 Kisses, with Evan discussing how he made the film. This film also won the Best Film Award in 50 Kisses too. Another great example of good notes and effective re-editing. To balance out this and the previous example, can you give us an example of a film that still made it into 50 Kisses, but the filmmaker perhaps disagreed with some of your comments and didn't make all the changes that were suggested? Also, way back... I forget when... you referenced a film that the filmmakers almost didn't submit because it had problems (I think it was audio?) they felt were too great to overcome, but the Create50 team took over and helped save that film, and it went on to be included in 50 Kisses. Can you share that one with us, too? I've been curious about it ever since you first mentioned it. All the films and scripts are still on the 50 Kisses website for you to go through. Ultimately we have editorial right, and if the filmmaker does not agree we cannot include the film. Happily everyone has agreed the rework is an improvement.